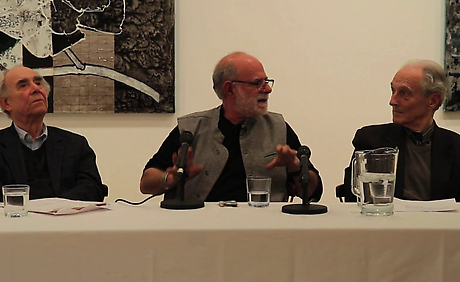 Robert Kushner, Robert Berlind, and Irving Sandler in conversation from DC Moore Gallery on Vimeo. ROBERT KUSHNER has exhibited extensively in the United States, Europe, and Japan. Solo exhibitions have taken place at the Whitney Museum of American Art, Brooklyn Museum, and Philadelphia Institute of Contemporary Art. His exhibition, New Paintings / New Collages, will be on view until January 5, 2013. ROBERT BERLIND is an artist, writer on art, and emeritus professor, Purchase College, SUNY. His essay, “Robert Kushner: New Devotions of the Heart,” is featured in the catalogue for the current exhibition. IRVING SANDLER is an art critic, curator, and educator. He is particularly known for his writings on postwar American art, including Abstract Expressionism and the American Experience: A Reevaluation (Hudson Hills, 2009). Recently, Sandler contributed to the volume Amy Goldin: Art in a Hair Shirt (Hudson Hills, 2012), edited by Robert Kushner.